Bahraini history is one of the oldest and richest in the region; the kingdom has evidence of a settlement that goes back to 12,000 years. It was the seat of the ancient Dilmun civilization and has been inhabited ever since. 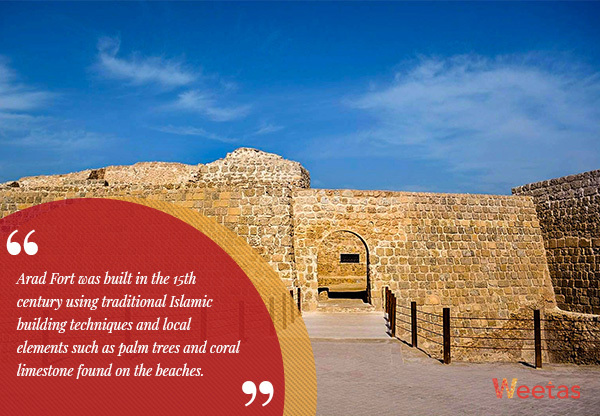 That is one of the reasons why forts in Bahrain are varied and belong to different eras. Let’s take a walk through the rich history of Bahrain as told through the massive forts in the island and learn about the diverse kingdoms that have come and gone before our time. Here are the most spectacular forts in Bahrain. When we talk about forts in Bahrain, of course, the first thing that comes to mind is Bahrain Fort or Qal’at Al Bahrain. Listed as a UNESCO world heritage site in 2005, Qal`at al-Bahrain was created by many successive layers of human occupation. The first fort built in this site was constructed three thousand years ago, while the present fort dates from the sixth century AD. The archaeological remains found in the site span the Dilmun, Tylos, later Islamic civilization and the Portuguese period. And because the site was the capital of the Dilmun civilization, it is home to numerous remains of Dilmun. Extensive excavations in the site have revealed residential, public, commercial, and military structures belonging to different times. Positioned atop a 17.5-hectare artificial hill, the exterior of Bahrain Fort is made of whitewashed stones and the interior holds a very spacious open courtyard. In addition to the fort itself and the surrounding ruins, the complex also houses a small museum which displays a lot of items from different eras, as well as a pretty good museum café too, overlooking the fortress and the harbor. Arad Fort was built in the 15th century using traditional Islamic building techniques and local elements such as palm trees and coral limestone found on the beaches. The fort was constructed on a strategic location overlooking the waterway which links the small island with the rest of Bahrain to keep invaders out. It has been alternately used and neglected several times through its history. During the early 19th century, Arad Fort became the seat of the Governor of Bahrain. The fort is square in shape and features a cylindrical tower on every corner. It is surrounded by a small trench; special wells were drilled for the purpose of filling it with water. It was also built with outer and inner fortified walls to provide more security. True to its Islamic heritage, the fort houses a well and an ancient Arabic date press inside the fort. After extensive analysis of its original building materials, Arad Fort was restored in 1980 with the same materials used for its original construction. And the surrounding beach area was recently revamped as well. The fort and the beach are beautifully illuminated at night and the area hosts seasonal festivals throughout the year. Some sources say that Riffa Fort was built during the reign of Sheikh Salman bin Ahmed Al Fateh Al Khalifa in 1812. Other sources, however, say that it was built earlier than that, specifically during the rule of the Persian Safavid Empire in the 17th century and then revamped and used by Salman bin Ahmed Al Fateh Al Khalifa. 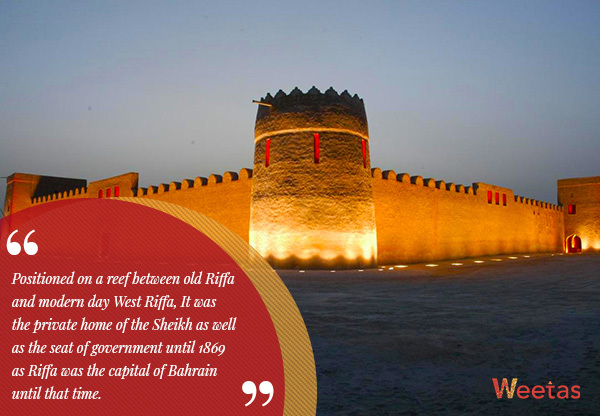 Positioned on a reef between old Riffa and modern-day West Riffa, Riffa Fort was the private home of the Sheikh as well as the seat of government until 1869 as Riffa was the capital of Bahrain until that time. In addition to the great strategic importance the fort held, it also holds significant architectural importance. One of the finest examples of the architecture and wall carvings in its era, the fort is one of the best places to showcase the effects of the wind tower. It also shows a glimpse of royal life in the 19th century. One of the largest forts in the region, it features three elaborate rectangular structures, each comprising several chambers and an independent court. The fort also features a massive façade on its northern side, a circular garrison amidst the chambers, a well, and a mosque. Additionally, Riffa Fort overlooks a wonderful view over the Hunanaiya valley, and there is an excellent café where you can sit and relax after touring the fort. 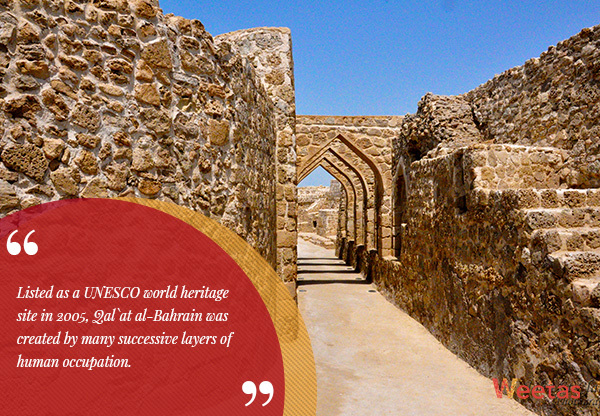 The starting point of the Pearling Trail, a UNESCO world heritage site, Bu Maher Fort is located south of Muharraq. The fort was built in 1840, during the Portuguese occupation of Bahrain. It might be the smallest one compared with other forts in Bahrain but Bu Maher Fort has got a rich history that lends it significant importance. It was renovated in the 1970s. However, its original foundations and dimensions were not uncovered until further excavation works were carried out in 2010. There is a visitors center in the site with a detailed map of the Pearling Trail.